by F. L. Irvine-Smith. (1948). IF IT WERE possible to condense all New Zealand's early history into one word, it would certainly be the word "SHIPS," for there is assuredly no country whose beginnings have been so closely associated with ships as our own. Each province of New Zealand has, so to speak, its "Mayflowers," and in respect of numbers, Wellington easily takes the lead. As everyone knows, or ought to know, the great Ship Date of Wellington - the annus mirabilis of its colonisation - is 1840, though long before this year, systematic attempts had been made to colonise New Zealand. De Thierry had tried; Captain William Stewart, whose name is given to Stewart Island, had tried; as early as 1825, in order to alleviate the distress following upon the Napoleonic Wars by founding for the purpose a New Zealand Colonising Company, a group of Englishmen had tried. This Company had sent two vessels, the "Rosanna" and the "Lambton," under Captain Herd and Captain Barnett, to establish workmen in New Zealand in order to prepare flax and spars for export to England. Reaching the south coast of New Zealand early in 1826, the vessels coasted north, looking for a likely spot to commence operations, followed up the east coast of the South Island, and entered Wellington Harbour, at no time visited by Cook. To this inlet Captain Herd, in honour of his friend, the Harbour Master of Port Jackson, gave the name of Port Nicholson, henceforth to be known to the early sailor man as "Port Nick" and to the Maori as "Poneke." Continuing north, they entered Hauraki Gulf, remained a few months, and finally left for Hokianga, already known to Captain Herd as the scene of a successful visit for ship spars in 1822 . 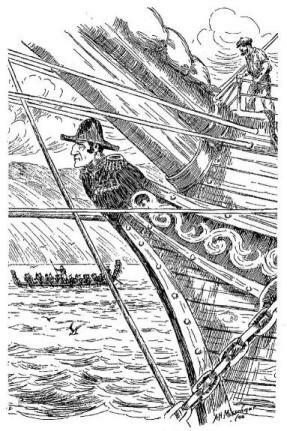 Hongi's wars, however, were at their height, and terrified by the threatening antics of the Maoris, who were well aware that the cargo of the Pakeha ships contained ten precious tons of gunpowder, the affrighted arrivals up-anchored and scurried away to Sydney. Thus ended the first New Zealand Company with a loss to the promoters of £20,000! But the new ideals of colonisation had taken firm root among English thinking men. Moreover, there was a genius behind the scenes. The hour had come and the man, and in 1837 a second group of Englishmen - some of them members of the earlier Company, men of vision, far-seeing, disinterested and influential, under the guidance and inspiration of "the man" - Edward Gibbon Wakefield - formed a second New Zealand Association, later to become the New Zealand Company, a group of private individuals for the renewed purpose of colonising this most distant outpost of civilisation. One says "under the guidance and inspiration of Edward Gibbon Wakefield" advisedly, for Wakefield was a man who reached the highest heights, the greatest coloniser the Empire has ever known, the most original thinker and the strongest driving force in the history of British colonisation. The epoch-making book he wrote from prison, carefully and anonymously published chapter by chapter by his friend, Robert Gouger, created as great a revolution in the field of colonisation as Darwin's "Origin of Species" in the realm of biology. It killed once and for all the old belief that colonies were mere dumping grounds for the sweepings of society, and made colonisation henceforth a national work, worthy of the best brains, ideals and energies of the race. Yet Edward Gibbon Wakefield also reached the deepest depths, and because those depths were of his own making - the abduction of a sixteen-year-old heiress under particularly mendacious circumstances, for which he rightly suffered incarceration in Newgate (1826-1829), his name has lived through a lengthy period of shame as well as fame. In spite of the fact that his memorial has for many years been placed in no less a spot than the British Houses of Parliament, his grave in the Sydney Street Cemetery (1), Wellington, where he died in 1862, for eighty years lay officially neglected and untouched. It was not indeed until Wellington commenced its national clean-up in preparation for the Centenary of 1940 that, no doubt anticipating a pilgrimage of overseas visitors to the spot, the city included in its operations the Wakefield plot, and one of the last and most graceful acts of the Governor General, Lord Bledisloe, before his return to the Homeland in 1935, was to donate one hundred pounds, from the interest of which floral tributes might be laid on the grave of the Great Coloniser at each anniversary of his death. Of all the ships that came in early days adventuring to these shores, there are at least four whose names will probably be held in longest memory. (1) (2) First - and earliest - are Tasman's vessels, almost toy-boats to modern thinking, the war-yacht "Heemskerck" (60 tons) and the brig "Zeehaen" (100 tons). With these, on December 13th, 1642, Tasman touched New Zealand off the coast of Westland, anchored unhappily in Massacre (now Golden) Bay, sailed away north, hugging the coast, missing Cook Strait, though he had a feeling from the rip of the current there must be an outlet, and said farewell to this new "Staaten Land," as he called it, by bestowing the name of his Governor's Lady upon its northernmost tip. Not much to record - a bit of the west coast of both islands - but what was done was well done, and as a first contribution to new knowledge, was invaluable. No claim was made to the new land; no Dutch flag hoisted anywhere on its shores, nor did Tasman ever set foot upon it. Nevertheless he was a very great navigator. (3) Very different was the result of the visit, or rather visits, of James Cook (1728-1779), the greatest navigator of the Seven Seas, the man who takes foremost place among those who have helped "to draw the outlines of the habitable globe." In his equally famous craft, the "Endeavour," a cat-built barque of 370 tons, originally built for the North Sea coaling trade, he charted in 1769, with almost unerring accuracy, the complete coastline of both the North and the South Island, planted the British flag, and here and elsewhere set a standard that carried British seamanship and exploration to the very stars. (4) Fourthly, there was the "Tory," whose memorable voyage of 1839, in defiance of official antagonism, changed the whole face of our history, and set upon the shores of Port Nicholson the present capital city of the Dominion. Colonel William Wakefield (1803-1848), brother of Edward Gibbon Wakefield, and newly appointed Resident-General to the Company in New Zealand, armed with instructions to select a site for the chief settlement and purchase land for the coming settlers. Edward Jerningham Wakefield (1820-1879), the only son of the Great Coloniser, a youth of brilliant promise, who was to write the best account of those early days in "Adventure in New Zealand," published in 1848, but whose intractable temperament and lack of stability rendered the closing years of his life in, compatible with its early promise. Dr. Ernst Dieffenbach (1801-1855), the son of a Lutheran clergyman, was at that time a German political exile in England, who had been appointed naturalist to the Company. He is the author of copious contributions to the early scientific records of the Colony. He died at Giessen, where he occupied the Chair of Geology at the University. Dieffenbach was the first European to ascend Mt. Egmont. Major Charles Heaphy (1822-1881), draughtsman and artist to the New Zealand Company, writer, surveyor, soldier and explorer, was a man of many parts. He was a very fine watercolourist, whose sketches of Early Wellington are among the city treasures of the present day - an inherited taste, for his father had been one of the founders of the British Society of Artists. In later years the gallant Major was to gain fame in the Waikato War by being the first in New Zealand to win the Victoria Cross. Mrs. Heaphy (nee Miss Catherine Letitia Churton) who died in 1910, bequeathed her husband's medal to the Auckland Art Gallery. Major Heaphy died in Queensland in 1881. Dr. John Dorset (1807-1856) had been surgeon to the British Legion in both Portugal and Spain. Returning to England in 1839, he had met a feIlow legionnaire, Colonel Wakefield, through whose influence he was appointed principal surgeon to the New Zealand Company, not surgeon of the "Tory," a post held by Mr. Geo. P. Robinson. The old Dorset home, built by his brother, William Dorset, in 1847, is still standing. Captain Edmund Mein Chaffers, R.N., Captain of the "Tory," had already visited New Zealand as the acting master of the "Beagle" when making its survey voyage (1830-1836) under Captain FitzRoy, with Charles Darwin as naturalist. In 1839 he gave up his naval career to take command of the "Tory," and shortly after his arrival he made the first chart of Port Nicholson. In 1840 he was made Harbourmaster of Wellington, but disagreeing with the Government, returned shortly after to England. Richard Jennings Lowry, who soon after this voyage lost his life in the South Atlantic, was chief mate. In April, 1840, he succeeded Chaffers in command of the "Tory," but after his own death at sea in the same year, his brother Nicholas, who had joined the vessel in Sydney, took charge. On January 23rd, 1841, the "Tory" was wrecked off the Philippines, and Nicholas Lowry died later at sea on board an American whaler. William Spratt Elgar (1817-1886), the boatswain, in spite of his youth, was already a seaman of wide experience. As well as having made voyages packed with recorded adventure, to various parts of the world, he had studied navigation at the Deal Nautical School, and in later life, as Captain W. S. Elgar, became Pilot of the Cinque Ports. He is buried at Deal with his three daughters. Two of his sons, Martin and Charles Elgar of Featherston, settled in New Zealand. There was also on board a native Nayti, or Nahiti, to act as Maori interpreter. He had been taken to Europe in a French whaler, "Mississippi," in 1837, and for the past two years had resided in the home of E. G. Wakefield. Published in the first number of the "New Zealand Journal," 1839, is a tactfully worded farewell letter by the departing Nayti to his English benefactors. Another member of the ship party, on its final lap, was James Heberley, whom Colonel Wakefield had found at a whaling-station in the Marlborough Sounds, and whom he commissioned to pilot the "Tory" into Port Nicholson. Heberley, for a time pilot of the port, was a somewhat picturesque nautical figure in the early days of the province. In later years his grandson, Thomas Heberley, was a most expert Maori carver, by whom many of the valuable specimens in the Wellington Dominion Museum were either contributed or restored. Yet another passenger taken on at the Sounds was "Dicky" Barrett (1807-1847), destined for a short time to play an active part in the new settlement. Born in London, he had had sea-faring experience, first in Australian and later in New Zealand waters, and with a small party of whalers, was one of the defenders of the Taranaki natives of Ngamotu against the invading Waikato tribes in 1831, trekking later with the victorious Ngatiawa to Port Nicholson, and then on to Te Awaiti in the Sounds. Here Colonel Wakefield saw him, and finding him a good Maori linguist and a friend of Te Puni, engaged him to accompany the party across the Straits in order to facilitate the purchase of land. Barrett was himself married to a Maori of high rank. In 1843 he returned to New Plymouth, where he died in 1847. The "Tory" also carried £6,000 worth of goods for barter, £1,000 of specie, and nineteen thousand bricks. The vessel made for those times a very quick passage of ninety-six days, sighting no land on the way save a distant glimpse of the Canaries. Captain Chaffers notes with pride in his log: "She passed everything she saw." Colonel Wakefield too, kept a diary of the voyage. The identical volume reposes in the Turnbull Library today (2), but the details of the trip are meagre. The Colonel was no Clark Russell. On the 16th August, 1839, the vessel dropped anchor just where intended - in Ship Cove in Queen Charlotte Sound, for the Captain was using Cook's 1779 chart. There Wakefield at once set about the task of looking for a site for the settlement, but the district was found unsuitable, and securing the services of Heberley as pilot, and Barrett as interpreter, away they sailed for Port Nicholson, and on September 20th, 1839, dropped anchor at 3 p.m. between Somes Island and the Pito-one Beach -"good anchorage, eight fathoms, muddy bottom." One can almost hear their sighs of relief. It was not an easy matter to enter Port Nicholson. There was at the entrance a partly submerged reef to negotiate, to which was given the name of the interpreter pro tem, Barrett Reef (4), while the passage taken, between the reef and the shore, was appropriately named for the "Tory's" captain, Chaffers Passage. The next headland to the right was called Pencarrow Head, after the Cornish home of one of the Company's directors, Sir William Molesworth, whose brother was shortly to arrive in the "Oriental," and one on the left, Point Dorset, after Dr. John Dorset, the surgeon-in-chief of the Company and a passenger on board. On Pencarrow was placed in 1842 the first temporary beacon to guide vessels into Port Nicholson, later to be replaced by the well-known lighthouse which shed its first beam, January 1st, 1859. Continuing up the harbour, due north, they passed the smaller island to which Colonel Wakefield gave the name of Ward Island, after John Ward, the Secretary of the Company, though the late Mr. Fildes, a careful historical investigator, inclined to Sir Henry George Ward, M.P., member of the New Zealand Association in 1837, a point which has never been settled. To the larger island was given the name of Somes Island (its native name was Matiu), after Joseph Somes, M.P., builder of the "Tory," and at that time Deputy-Governor of the Company. The son of a Thames River lighterman, Joseph Somes in 1840 was one of the wealthiest and least ostentatious men of his day, and it is interesting to find that in later years his widow, Mrs. Maria Somes, made a generous bequest to Christ's College, Canterbury, New Zealand. In August, 1840, he succeeded the Earl of Durham as Governor of the Company, as well as being at the time of his death, member of parliament for Dartmouth. He died somewhat suddenly in 1845, and his two sons carried on the great ship-building firm for about the next thirty years, when it became known as the Merchant Shipping Company. 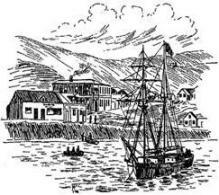 The "Tory" dropped anchor, September 20th, 1839, between Somes Island and the Petone Beach, not too near the shore, as the attitude of the Maoris was "problematical." To the south-west was visible another bay, and to this Colonel Wakefield gave the name of Lambton Harbour, after the Chairman of the Company, the Earl of Durham, whose family name was Lambton, to the narrow skirt of Lambton Harbour, fronted by the sea and backed by scrubcovered clay cliffs, the name of Thorndon Flat, after the Essex home of Lord Petre, a Company director, and to its eastern extremity the name of Point Jerningham, after his nephew, Edward Jerningham Wakefield. The river reaching the sea through the Pito-one sands received the name of Hutt River (7), after Sir William Hutt, M.P., another director of the Company, and at the earliest opportunity, they bathed and fished within a "snug cove" close to the anchorage, and this was named after the chief mate, Lowry Bay. The following day, September 21st, there came on board two of the local chiefs, Te Puni and Wharepouri (8), (later to be commemorated in Wellington street names) and Wakefield proceeded to negotiate for the purchase of 1,100 acres of town land and 110,000 of country land required for the settlement. By September 27th there was concluded a deed of purchase, drawn up by Edward Jerningham Wakefield and translated into Maori, sentence by sentence by Barrett, which gave to the New Zealand Company, as Wakefield fully believed, all the land from Sinclair Head on the west coast to Cape Turakirae on the east and the crest of the Tararuas on the north and north-east. On September 30th the New Zealand flag was hoisted on shore and saluted with twenty-one guns. Colonisation had begun. The first purchase over, Chaffers, assisted by Lowry, busied himself with charting the harbour, which proved to be a magnificent expanse of twenty thousand acres of sheltered water, with an average depth of seven to eight fathoms; Heaphy, with investigating the wonders of Nature in the new land, while Wakefield, accompanied by Dorset and Dieffenbach, sailed away north to make further purchases for the Company. (9), Before his return to Port Nicholson the "Cuba" had arrived bringing the survey section, consisting of Captain Mein Smith, surveyor-general to the Company, and assistant surveyors, who at once proceeded with the work of surveying and laying out a settlement at the northern end of the harbour. There has been considerable discussion over the question of the selection of the Hutt Valley for the town. It seems clear, however, that Wakefield had from the first favoured the Thorndon site, but as he had set out for the north without leaving any definite instructions, the surveyors, upon arrival, used their own judgment, ran out a small jetty off Petone Beach, and commenced survey work immediately upon the more spacious, if uncertain delta of the Hutt River, the only level land of any extent in view. While such work was in progress, the first six of the Company's emigrant vessels, commonly known as the "First Ships," arrived in quick succession. These were the "Aurora" (January 22nd), from whose arrival is taken the date of the Anniversary of the Province, the "Oriental" (January 31st), the "Duke of Roxburgh" (February 8th), the "Bengal Merchant" from Glasgow (February 20th), the "Adelaide" (March 7th), and the "Glenbervie," a store ship, also on March 7th. The passengers of all these, with the exception of most of those in the "Adelaide," were landed on Petone Beach. Lovely white-winged ships of the past! For many a year beyond 1840 did they continue to glide into the placid waters of Port Nicholson, with their batches of eager-hearted pioneers. Looking down the list, one is struck with the stately names that many of them bore, and by the thought that scarcely one such name has been perpetuated by descendants of the pioneers they brought, in fact, the only example that comes to mind at the moment is the name "Gertrude" that reappears from time to time among the descendants of a prominent pioneer who landed from that vessel in 1841. A proud colonist should be he who could with true significance write "Tory" among his names, or that of many another pilgrim vessel. Every ship-name tells its story! But to return. It is easy to sit in comfortable modern surroundings and work up verbal enthusiasm for our early pioneering days, but the real thing was another story. 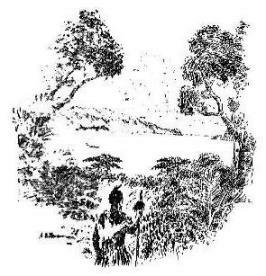 A huddle of lonely men, women and children, dumped upon the desolate shores of an uninhabited bay, possessions piled around, all Nature, as lief as not, in a warring mood, (10), not a familiar face, not a familiar landmark. There was at least a security about the ship-quarters, cramped as they were, that fell away as they set foot upon the fringe of this unknown bay, ringed with what seemed to be forbidding and impenetrable mountains. It needed strength and grit to set to work and build "Britannia Town," but such as it was, they did it, though their first homes were but canvas tents, rough slab huts, or raupo and toe-toe whares erected with the aid of the natives on the spot. Food was none too plentiful. A drought in Australia sent the cost of flour to famine prices. With heavy forest on all sides, cultivation was difficult. However well fitted out at the start, pioneering life was not conducive to economy in clothes, and rough usage soon reduced them to rags, or extempore outfits that taxed their ingenuity to its last limit. Mrs. Pioneer's best outfit might be a jacket and skirt fashioned from a spare, grey blanket, artfully trimmed with rick-rack braid salvaged from a tattered garment of better days; her spouse might go forth to work literally in "bags" - possibly in a piupiu. It was all part of the game. Writing to England (March 18th, 1840) a pioneer remarks: "Fustian coats and thick shoes are very fashionable, and you would laugh to see officers, doctors and dandies digging, thatching and chopping with great frenzy!" Fortunately, the local Maoris, threatened by tribal enemies on both coasts, were quick to see the advantage of the protection and trade of European neighbours, and bartered freely with pigs, fish and potatoes. Little by little, against heaviest odds, the settlers began to break down the wilderness around. Heaviest odds! On the night of May 25th, 1840, the whole of Cornish Row, a long line of reed and flax cottages belonging to thirty or forty settlers from Cornwall, went up in flames, with an earthquake to follow for good measure. As winter approached, recurring floods submerged the newly surveyed sections and homes until the goods and chattels of the beleaguered settlers floated out to sea. Dark days indeed, but the darkest of all was the day of August 25th, 1840, when a boat containing twelve settlers, within a hundred yards of Pito-one Beach, upset in seven feet of water, and only three lived to tell the tale. Hearts might break, but life must go on. Early Pioneering! It was, however, becoming increasingly clear that the Hutt site, spacious as it was, was too heavily penalised by Nature to admit of immediate home-making. Jerningham Wakefield notes: "The site was swampy and much intersected by sluggish creeks, the Iand being so level as to need drainage. Distance from the sea was an objection, especially as the river was navigable only at high water, and when the wind was southerly, the anchorage was exposed to a strong sea from the Heads, and the whole beach lined with rolling dangerous surf." Dr. Dorset all along had been a strong advocate for the Lambton site. Colonel Wakefield was equally willing for the removal of the settlement to the land-locked Lambton Harbour, and was ably seconded by Dr. Evans who, ever since his arrival in the "Adelaide," had carried on a vigorous campaign among the settlers for the latter site. Aided by the stentorian voice of the Doctor, the Lambton advocates finally carried the day, and the gallant company, with feelings dampened but undismayed, crossed the harbour (September, 1840) to open a new chapter on a new site in a new settlement with, later, a new name. The new name, bestowed by the instructions of the Company's Directors, was of course WELLINGTON,(11), and while it is true that the name was selected out of gratitude for the help given by the Duke of Wellington to the Company's previous colonising experiment in South Australia, it is interesting to reflect that the figurehead of the "Tory" was a representation of the Iron Duke. One likes to think of the vessel cleaving her way through these new waters with a figure of the Great Duke moving forward with fixed gaze to a spot where a great city was to arise that would bear his name. A coincidence, no doubt - but a striking one - and appropriate. The Duke was certainly a staunch "Tory," and Joseph Somes, its builder, ever a good conservative. Peace to their ashes! 1. The Government Gazette, October 26th, 1841, announced the setting apart of 18 ac, between Bolton Street and Sydney Street, for a cemetery. 2. Colonel Wakefield's diary was given by the colonel to his clerk, Mr D. Lewis, who presented it to Mr W. Tanner, who left it to the Turnbull Library. 3. These names were given after the chart of Captain Chaffers was finished. 4. This reef, which forms the chief impediment to the entrance of Port Nicholson, consists of a line of partly submerged rocks extending for half a mile parallel to the coast with an average width of about two hundred and dividing the entrance to the port into two passages, namely Chaffers Passage to the west now seldom used, and the Main entrace to the East, which has a clear breadth of about twelve hundred yards. The reef has unfortunately no fewer than fifteen wrecks to its discredit. 5. See Memoirs of Lady Dorothy Neville (1907). 6. See "Life of E. Gibbon Wakefield," by Irma O'Oonnor. 7. Its native name was Heretaunga, said to have been given in the thirteenth century by Tara and Taupaki, the sons of Whatonga, who named it after their earlier home in Hawkes Bay. 9. The "Adelaide" 171 days out from London, dropped anchor off Petone Beach in a terrific storm of thunder lightning and rain, to find the low-lying land of the Hutt Valley two or three feet under water. Dr. Evans and some of the passengers insisted upon being taken at once to Thorndon and there many of the "Adelaide" passengers disembarked. 10. He proceeded first (November 4th) to Cloudy Day and then on to Kapiti, where he purchased from Te Rauparaha land on both sides of the Strait. From here he went to Taranaki where he landed Dieffenbach to make a geological examination of Mt. Egmont, and then to Hokianga to inspect the New Zealand Company's property of 1825 at Herd's Point. 11. A very full meeting of the directors of the New Zealand Company took place on Tuesday, the 5th inst., where it was unanimously resolved that the name of 'Wellington' should be given to the first and principal town, which long before this time is in existence at Lambton Harbour.